Contact us for further information about how DCI can provide an affordable, dynamic web site for your firm today. Ron Byrne is a sound engineer of many talents, and has entire walls of CDs he has recorded and produced. The producers of American Idol were at Naked Ear. They were filming Naked Ear Recording Artist Jaz Anderson for the shows 2005/2006 contest season. Jaz went on to sing in front of celebrity judges Randy Jackson, Simon Cowell and Paula Abdul and was shown on the TV show twice. Brian Clancy is the principal of DCIWebworks, located in Denver, Colorado. His goal is to provide counsel and ideas along with the actual code development to insure that your web site adheres to industry standards while offering a professional customer experience for your audience. Assisted by other professionals in graphics, design and other elements of web development, DCI offers consistent service to a variety of clients and industries. We have the ability to provide rapid site deployment, email (newsletter and other mass mailings) services for qualified recipient lists and dedicated or shared-hosting packages. Enjoy the security of having your web site backed up to a separate server daily, automatically, and that backup available for use at your sole discretion. You can find out more by contacting us via email or calling 303.393.1215.
to provide a quality hosting experience with outstanding design and code performance, personalized service and consistent timely updates of your web site as needed. DCI now offers the very latest in server technology and power for our clients. Every site enjoys more disk space, bandwidth, memory and CPU output. We now have extended backup services which occur each night, IN ADDITION to the standard backups offered by our collocation center. Enhanced services include a constant Data Lock-Box from R1soft Enterprise Continuous Data Protection . How it works is simple but powerful. We bolstered the service with a CDP addon that gives us web access 24/7 to login and restore files directly from the secure backup systems for any discreet account or number of accounts. 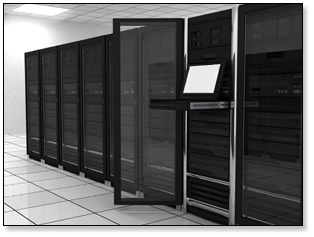 DCIWebworks' clients enjoy 99.9% uptime in a Virtual Private Server environment. The customizable experience begins with a robust cPanel® Control Panel. You can explore the Control Panel in detail and find out more about the DCIWebworks hosting experience with cPanel® here. Included are descriptions, pricing and ordering information for the distinct hosting packages the DCIWebworks offers. All packages include both email and telephone support during normal business hours (7 AM-6 PM MST). Whether you're looking for a simple hosting solution that includes telephone support, or a complete, dynamic web site with a shopping cart, forums, and other interactive features, DCIWebworks can provide a cost-effective solution. We can build basic sites from $500 and up, truly affordable web sites with professional features and capabilities. Check our pricing for further information. These are professional sites, adhering to the latest industry and browser standards. You can enjoy a remarkable and unique site in just a few days. When completed, you'll get all of the source materials, templates, graphics and other assets that were used to create your site. Once published, we offer the best maintenance possible, with updates handled within 24 hours, billed in 1/10th of hour increments to keep your costs low. We employ the latest technology to eliminate SPAM from your inbox, and help our clients deploy mail form packages with optical security and other encryption features. The key is personalized service and telephone support for every aspect of your web site. Each web site we create utilizes the latest tools and developments in dynamic HTML, Flash and PHP. Sites are created using Adobe CS4 Suite® modules including Dreamweaver, Fireworks and Flash Professional. Dynamic Communication, Inc. has been a leader in corporate telecommunication analysis and reporting for over twenty five years. The DCI TELEMARK System has been the benchmark AS/400-based telephony solution for Fortune 500 clients, leaders in healthcare, nuclear power, mining, banking and other industries, both in the United States and abroad.